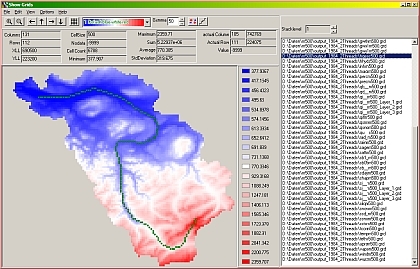 Graphline is a graphical WaSiM help tool which is offered as shareware. It can be used for fats viewing of WaSiM input and output grids and stacks and also for making changes to the grids and stacks (editing multiple cells). Showgrid can view binary and ASCII formatted grid files. Size and number of grid files are virtually unlimited (limited only by the hardware and operating system). When loading a grid or stack layer, the statistic values will be calculated and dispayed. ShowGrid is optimized for fast visualisation, analysis and editing of spatial WaSiM input and output files. A set of nice features (e.g. zooming, grid editing, creation of cross sections, displaying of flow fields with vectors). Showgrid can be controlled by mouse and/or by kyeboard shortcuts. Further information on using the tool and on licensing is available in the (German) user manual.